Cooking is a lot of fun and eating is even more fun. 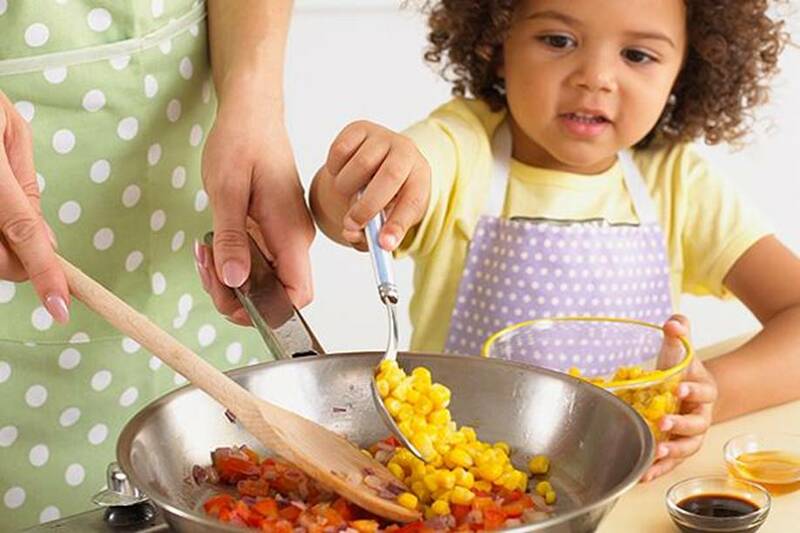 Whether you’re the type that likes to cook or not, you’re probably wondering about the right time to introduce cooking to your kids. Well, the truth is that it’s never too early to start with the basics. Of course, you don’t want to force anything on them, but lightly introducing things into your children’s lives is the only way to know their interests and to be able to push them in the right direction on time. They may not wish to become world class chefs, but being able to prepare a few meals is definitely considered a perk at any age. In that respect, here are a few ways you can do this subtly and successfully. Before you start, you need to set your expectations straight. You need to prepare the space which means clearing out all sorts of dangerous kitchen tools and ones that are a bit pricey, as there’s a chance they may be damaged or completely destroyed. You should know that your kitchen may be in an unrecognizable state once the whole process finishes and that you shouldn’t be mad at your kids for it. Cooking is messy, especially for first-time chefs, so if you take it easy and not stress out, it will be much more enjoyable. You need to know that cooking with your kids will take much longer than cooking on your own. It’s important to let your kids actually do the cooking and not you. Remember, this should be a fun and interactive activity, not a one-man show. So, let your kids do the work, you can even let them use the appliances. For instance, there are some great KitchenAid food processors that are user-friendly and kid-friendly, as well. Be clear and make sure to give your kids simple tasks, but also make them feel important and praise them for a job well done. Another essential part of introducing cooking to your children is choosing the right recipe. It needs to satisfy certain criteria. First of all, it should be simple enough for a child to do with a bit of help on your side. Then, you need to make sure that your child actually likes the dish you’re preparing, since the most rewarding part of the cooking process is enjoying your product. Make sure it’s something your child is very enthusiastic about as it will be the best way to make them interested in cooking. Some concrete suggestions may be pasta, pizza or deserts like muffins and some easily-made chocolate cake or cookies. 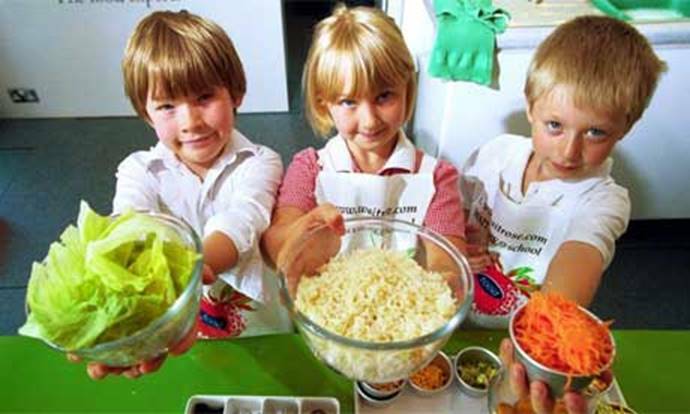 Introducing your children to the world of cooking is more than teaching them how to cook. It’s about discipline, punctuality and hygiene. You can use this opportunity to stress the importance of clean tools and clean hands. If you must touch the food, it should be with your gloves on or directly with your hands, given that they are clean and your nails are kept short and tidy. If you have a little girl, it’s important to tell her to tie her hair in a ponytail or a bun, so that hair doesn’t fall into the food. Make sure to keep it fun. This is a great opportunity for your kids to see what holding dough feels like and even what it tastes like. Sure, it’s disgusting, but it will give them a chance to see the difference in taste before and after baking. On the other hand, they’ll see that cream and custard taste great right at the beginning. You can play a guessing game whether something will be delicious or gross. It’s guaranteed to make you laugh and enjoy the whole process even more. 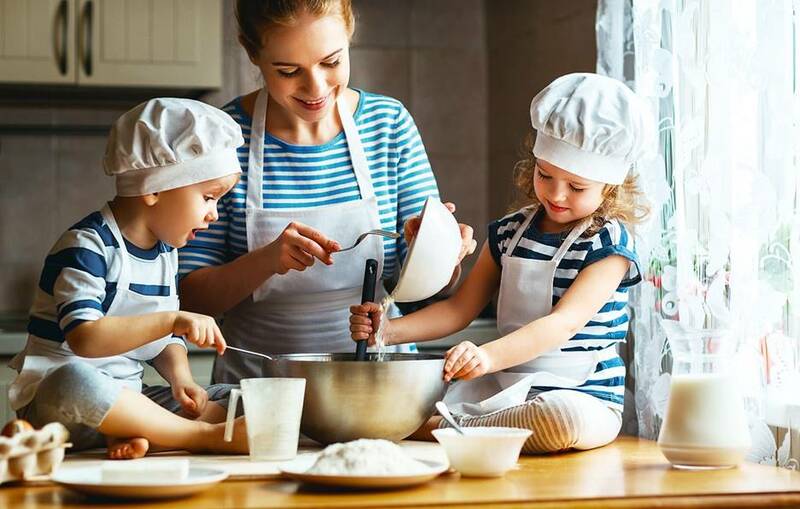 All in all, showing your kids how to cook is a great opportunity to spend some quality time with them and teach them many things in the process. Plus, it’s very entertaining and allows many different creative approaches. In the end, whether your kids eventually like cooking or not won’t matter if they were having fun in the process. Finally, the quality time spent getting to know your kids is what matters the most and you should try your best to cherish those moments and be encouraged to make traditions of joint activities you all enjoy.